One Thousand Sources combines a melodic approach of the instrument and unusual techniques like caresses and friction of the skin, playing on the ropes that stretch the strings, and glissendo. 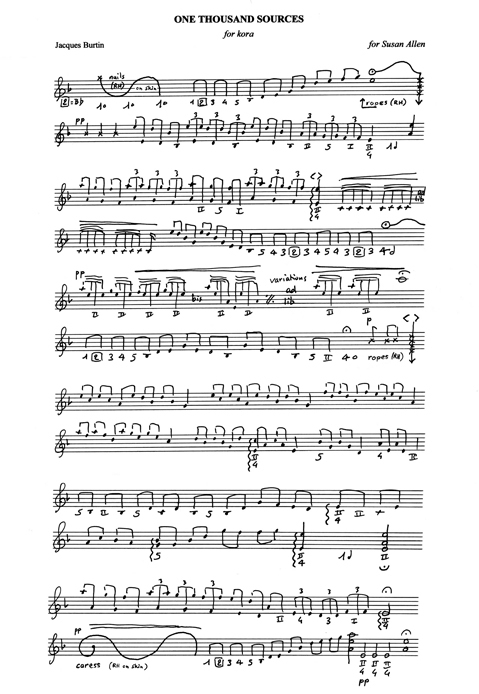 This piece dedicated to Susan Allen was premiered in New York City on May 12, 2006. One Thousand Sources was featured among the works of twelve composers from around the world in Sonic Channels, a concert curated by Melissa Grey and Jim Briggs III, and hosted by the New School University and the Lower Manhattan Cultural Council. Born in Paris, France, Jacques Burtin is a composer, improviser, writer and filmmaker. He plays the kora, the gravi-kora and the piano, and he has issued about forty CDs. Burtin conceives multidisciplinary shows, sound or video installations with musicians, painters, poets and dancers. He directs experimental films, cinematographic poems and art documentaries. His films “What damns me saves me » and “The Dialogue of Shadows » were screened at the Festival de Cannes in 2011 and 2012. “L’Enfant de la République” (« The Child of La République ») was screened at the Bilbao Short Film Festival Zinebi in 2015. 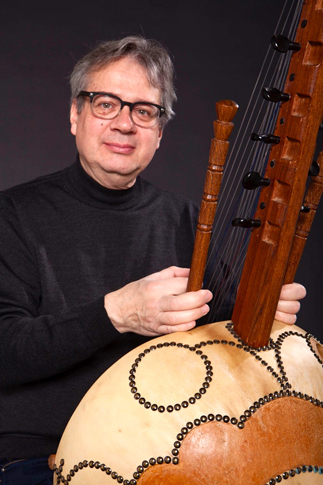 Burtin teaches kora and gives masterclasses. Between 2002 and 2012, he conducted sessions of Initiation to Interdisciplinary Creation and Performance at the Fine Arts School of the University of Deusto (Bilbao, Spain) along with dancer and choreographer Alicia Gómez Linares. His latest works are Islands of Light, a eight minutes video after Christian Bobin's poems, and Lazarus for piano and soprano. He is currently working on a multidisciplinary project based on the twenty-two Major Arcana of the Tarot of Marseilles. An homage to his late colleague, harpist Susan Allen, this project explores the creative act via improvisation.